Triangle is the most stable polygon in geometry. I'm wondering why then the building bricks are all rectangular, not triangular? Re: Why are bricks rectangular, not triangular? Having laid a few bricks myself, I would suggest it all has to do with the shape that works best when trying to build a wall. Imagine trying to do that with a triangular shape instead of the typical rectangular one we now use. You can buy (or make) flat triangular blocks but they are of limited use apart from decorative paving. If you want to make a rectangular building or wall, you need right-angled triangles and you just end up with twice as many mortar joints and only one bond pattern element, hence a weak wall. Tetrahedral blocks are even more useless because they can't be stacked. The traditional brick shape can be stacked and bonded in several different ways, and laid in three different orientations for strength, decoration or weathering. Thanks. I guess the answer is more of an economic concern than a physics one. The answer is one of common sense: you can't build anything useful with triangular bricks! You could easily build a wall out of equilateral bricks. The edge pieces would all need to be cut. One thing about a structural brick wall is that it is designed to have a lot of overlap which is important for the structural strength of the walls. Doing a wall as above, one would lack overlap, and one would have to make sure that all the lines were straight, otherwise it would look pretty bad. There may be more flexibility in shapes and layouts of tiles. The problem is that the second blue course would slide and split the lower courses if it was laid before the lower course mortar had set. Mortar has reasonable compressive strength (you can quickly build 5 courses without the first mortar layer distorting) but is pretty useless in shear, even when set (that's how we demolish walls). If one staggered the triangular (prismatic) bricks (just translate every next row by half of a brick), they wight not slide so quickly. As pictured above, the wall would be very unstable. Another consideration is the durability of the bricks before any assembly. The corners of a rectangular prism are much less susceptible to crumbling than the corners of triangular bricks (90° stronger than 60°). You still have the problem that each white brick is trying to push two blue bricks apart. Wet mortar is very weak in shear or tension. If you offset courses you will be supporting the whole of a blue brick on the point of the one below it, whereas rectangular bricks distribute the compressive load evenly over the entire block. What a few respondents to this thread are forgetting is; Whether triangular or rectangular, the strength of the brick is many times that of the mortar used to hold them together. And I would hazard a guess that there is very little difference between the relative strength of these two designs anyway. And all this takes little account into the ease with which our brick wall could be constructed. Having done a little brick laying myself, I would view the converging points of the triangular brick to be suspect and very likely to experience some breakage while handling and especially during transport between source and building site. I really don't think a triangular brick would be very practical or easy to use at all. I don't think I would choose the triangles as structural bricks. However, I don't see anything wrong with using triangular tiles for non-structural applications. One can easily add spacers to one's tiling applications to keep them in place until the mortar or adhesive sets up. At least in the USA, many of the bricks used on the outside of houses, and even commercial structures is just facing, and the main structure is wood or concrete frame behind the brick. Thus, one can use round river rock, or pretty much anything for the non-structural facing. So, triangular facing would be just fine. 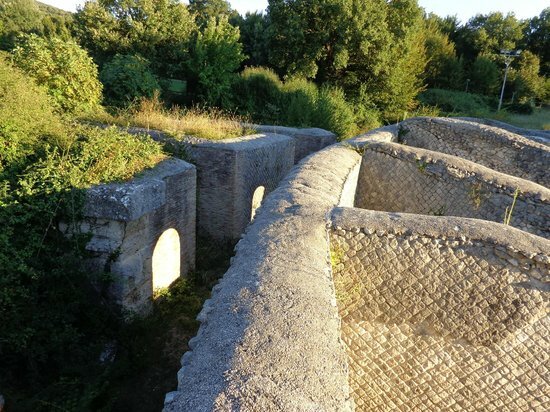 Somewhere between Perugia, Italy and Terni, Italy, there are some Roman ruins in which they used square stones placed at a 45 degree angle like diamonds. And, it has withstood the test of time for the last 2000 years or so. Hmmm... it has been a while since I was there, but here are some photos I found on the web. Very pretty, but as you can see from the second picture, the diamond blocks are tiles on a mass-concrete wall. 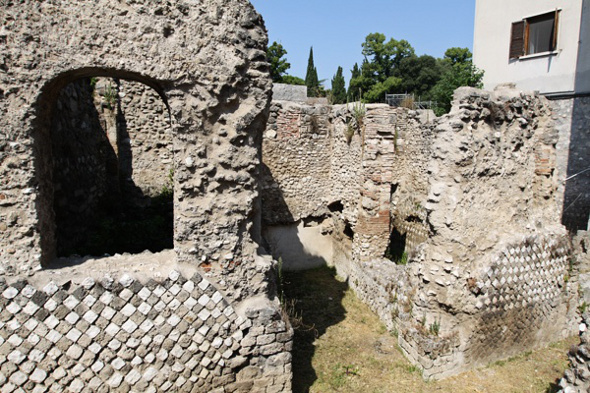 Roman concrete was pretty rough as they didn't use graded ballast and the cement was at best variable, so the walls are usually finished with brick or tile for appearance and weathering. I love this thread. The compression strength of a stiff mortar is more than sufficient to support bricks of any reasonable size and weight unless your wall is one brick wide and you have a bionic bricklayer. Mortar gains compression strength very quickly, which is why a good brick layer can lay any thing up to a 1000 bricks a day in a wall only 3 or so metres wide. Once cured the mortar compression strength had better be greater than the brick otherwise the resident engineer or clerk of works will quickly condemn the corresponding wall. The issue of shear in the wall running down the sloping path will only be a factor if there is foundation failure in which case the wall is the least of the worries. The answer is simple. Walls need to turn corners and are supported by piers. I do not see any way a triangular brick can do this. Nor can a cubic one. The rectangular brick with one side twice the other was found about 5,000 years ago to be the best way to tie a wall around a right angled corner and remains so to this day. I love this thread. ... Walls need to turn corners and are supported by piers. I do not see any way a triangular brick can do this. Nor can a cubic one. The rectangular brick with one side twice the other was found about 5,000 years ago to be the best way to tie a wall around a right angled corner and remains so to this day. I think it's great as well. Good school project to test various brick shapes. Having done some diy I found tne big advantage of the rectangular brick is in what is called the bond. This is the staggered pattern you see in a wall. Even if the mortar fails the bricks below support the ones above and you can easily remove bricks leaving a triangular opening - apex at top and nothing will fall down. This makes it easier to form window and door openings and makes the structure resilient against damage. Fascinating topic if you decide to study it. I did some work with the building research centre and one of their demos is removing bricks from a house wall to show how strong the structure is, they removed a lot of bricks before it failed. What would have to change atmospherically to have a triangular shaped planet? Why Are Triangular Sandwiches Preferred ?